A surprisingly strong rebound in California’s real estate market helped lift a key home price index for the eighth month in a row. That’s good news for people who plan to sell their homes this spring. 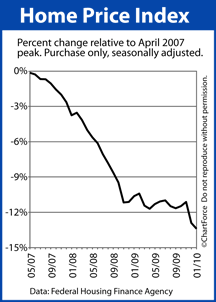 Prices are now up almost 4 percent from the bottom in May 2009, but still almost 30 percent below the May 2006 peak. Prices rose 0.3 percent from December to January on a seasonally adjusted basis, according to the Standard & Poor’s/Case-Shiller 20-city home price index released Tuesday. Prices increased in 12 cities in the index. The biggest monthly gain was in Los Angeles, where prices rose 1.8 percent from December. And real estate agents say there’s a distinct sense the worst of the downturn is over. Prices in San Diego, meanwhile, rose by almost 0.9 percent. Phoenix had the third-largest gain at 0.8 percent. Compared with the same month last year, the 20-city index was off just 0.7 percent from last year at a reading of 146.32. That was the smallest decline in almost three years and in line with analysts’ expectations, according to Thomson Reuters. Rising home prices also could boost consumer optimism. For most Americans, their home is their largest asset, so as values climb from the depths of the housing bust, homeowners feel wealthier and more comfortable spending. And, for homeowners who owe more on their mortgages than their properties are worth, rising prices rebuild equity. Consumer confidence rebounded in March after a February plunge, according to a survey released Tuesday. The Conference Board’s Consumer Confidence Index rose to 52.5 in March, recovering about half of the nearly 11 points it lost in February. Still, shoppers remain cautious and there are signs that last year’s housing rebound won’t last. Home sales sank during the winter, and government incentives that have propped up the market are ending. Another reason for the positive news is simply that the Case-Shiller index measures a three-month average of home prices. So January’s report included November’s strong home sales. However, bargain-hunting homebuyers continue to pack open houses in California, often facing off with investors for foreclosed homes. In February, bank-owned properties made up 44 percent of all resales in the state, according to MDA DataQuick. In Southern California, they accounted for more than half of resales. With such high demand, supply is dwindling, driving prices higher. Meanwhile, the state’s unemployment rate has flat-lined of late, and that’s made buyers more comfortable about purchasing a home than they were just six months ago, said Richard Green, director of the Lusk Center for Real Estate at the University of Southern California. California home sales will likely get a boost in coming months thanks to a new serving of government stimulus. Last week, state lawmakers enacted a tax credit of up to $10,000 for homebuyers that kicks in May 1. The state allotted $100 million for first-time buyers and another $100 million to anyone who buys a newly built home. California had a round of tax credits last year that proved to be popular; that program ended in July. The latest incentive picks up where a federal first-time homebuyer tax credit of up to $8,000 is scheduled to leave off when it expires at the end of April. Should the Obama administration extend the federal tax break, that could give homebuyers in California even more reasons to buy. Still, there remain pockets of weakness. Sales of homes priced above $500,000 are sluggish. And despite rising prices, more than one-third of all homeowners with a mortgage still owe more on their loans than their homes are worth, according to First American CoreLogic. Among the cities showing monthly price declines in January, the biggest drop was in Portland, Ore., where prices fell 1.8 percent from December. Chicago and Seattle saw declines of 1.7 percent, while prices in Atlanta fell 1.5 percent. Standard & Poors released its Case-Shiller Index Wednesday. The report shows that, on a seasonally-adjusted basis, between December and January, home prices rose in more than half of the index’s tracked markets. The strength of this month’s Case-Shiller report, however, should be put in context. For one, the report is on a 2-month delay; it’s showing data from January, before the start of the Spring Buying Season and before the rush to beat the tax credit. Anecdotally, buyer interest has been strong since, leading to the types of multiple offer situations that drive home prices northward. In other words, home values may be even higher than what’s reflected in the January Case-Shiller data above. Furthermore, the Case-Shiller Index measures home values in just 20 cities nationwide and they’re not even the 20 biggest cities. Houston, Philadelphia, San Antonio and San Jose are specifically excluded from the report and each ranks among the country’s 10 most populous areas. Despite its flaws, though, the Case-Shiller Index remains important. Much like the government’s Home Price Index, the private-sector report helps to finger broad housing trends and housing is still considered a keystone in the U.S. economic recovery. Even if it IS two months slow. I’ll have the Orange County version of this report in a few minutes…..please stay tuned. And Bank of America, the country’s largest mortgage servicer, has more than doubled the number of short sales it processed in recent months. Mortgage markets tanked last week, raising rates to their highest levels in a month. Most of the losses occurred Wednesday in what was the worst 1-day mortgage market performance in more than 6 months. Even Friday’s rally could barely dent the losses. Most of the movement was tied to geopolitical concerns and worries of a ballooning federal debt load. 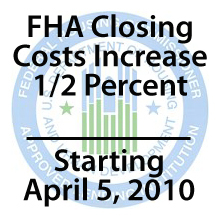 The best time to lock a conventional or FHA mortgage rate last week was Tuesday morning. This week, markets should remain volatile. There’s a large set of economic data due for release, plus trading volume will thin as the week goes on because markets are closed Friday for Good Friday. Coincidentally, Friday is also the day that the March jobs report is released. 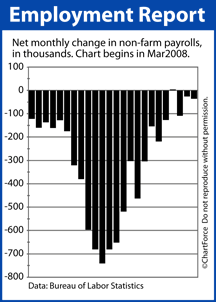 The non-farm payroll report is expected to show net job growth of 187,000 in March. This is a large number as compared to last month’s net loss of 36,000 job. However, analysts are already dismissing March’s numbers as skewed by both the bad storms of February, and the temporary hiring of Census workers. In most months, major job growth would be bad for mortgage rates. This month, that won’t be the case. It will take a figure north of 200,000 to cause rates to rise and the higher the actual number, the more that rates will respond. Also this week, on Wednesday, the Federal Reserve’s $1.25 trillion program to support mortgage markets sunsets. Fed insiders estimate that the program dropped rates 1 percent since its inception in 2008. It’s reasonable that mortgage rates will rise after its end, therefore. Orange County median home price 5.6% too low? Economists at IHS Global Insight and PNC Financial conclude that Orange County homes were priced 5.6% too low in 2009’s fourth quarter. Comparing local house-sale prices to historical real estate and economic trends, IHS-PNC estimates that Orange County homes were undervalued for the 7th consecutive quarter after being overvalued for the previous 20 quarters. The latest 5.6% undervaluation — on par with the likes of Louisville, Ky.; Jefferson City, Mo. ; Fairbanks and Abeline, Texas — was a roughly equal to the previous 5.5% in Q3. The current wave of Orange County undervaluation peaked at 11.4% in Q4 of 2008. For historical memory sake, Orange County overvaluation peaked at 33% in 2006’s Q2. Atlantic City, N.J., was the most overvalued nationally (33% too high) in Q4 2009. One reason the undervaluation is shrinking locally is the rising price of homes sold. By IHS-PNC math, O.C. home pricing was up 6.4% in a year as 2009 ended — 3rd biggest gain among the 330 regions tracked nationwide. The D.C. region had the largest Q4 price gain (+10.5%) while Las Vegas had the biggest loss (-19.4%). Comments Off on Orange County median home price 5.6% too low? There is an Evaluator Tool and a Questionnaire. If you can no longer afford to make your monthly loan payments, you may qualify for a loan modification to make your monthly mortgage payment more affordable. Millions of borrowers who are current, but having difficulty making their payments and borrowers who have already missed one or more payments may be eligible. To see if you may be Eligible fill out a brief questionnaire. For the evaluator tool go here. If you are having difficulty – you are not alone – check out some of these resources, for some solutions – and good luck! Some first time California home buyers seem poised to get $18,000 in tax credits. There is an interesting wrinkle with the new bill just signed by Governor Schwarzenegger, regarding tax credits for California home buyers – state bill AB 183. So, if I read that correctly – and remember, I am NOT a qualified tax preparer, or attorney – that seems to suggest that if you are IN escrow before May 1st, 2010, and close escrow prior to July 1st, 2010, you might qualify to receive BOTH tax credits. If you happen to be one of those fortunate California home buyers, and you seem to qualify, you should definitely look into this potential windfall. Comments Off on Some first time California home buyers seem poised to get $18,000 in tax credits. $420,000 median selling price that is +10.5% vs. a year ago and -35% below June 2007’s peak of $645,000. The most recent median is 14% above the cyclical low hit in January 2009 at $370,000 — a current bottom that was -43% below the peak. Single-family homes resell for 32% less than their peak pricing (June ‘07) while condos sell 39% below their peak in March 2006. Builder prices for new homes are 39% below their February ‘05 top. Single-family homes were 73% more expensive than condos in this period vs. 70% a year ago. From 1990-2008, the average house/condo gap was 57%. Builder’s new homes sales were 4% of all residences sold in the period vs. 3% a year ago. From 1990-2008, builders did 15% of the selling. How did your neighborhood fare? Check our ZIP-by-ZIP data HERE! Home Price Index Shows National Home Values Slightly Lower, But Not Locally. Home values fell again in January, according to the Federal Home Finance Agency’s Home Price Index. Values were reported down 0.6 percent, on average. We say “on average” because the Home Price Index is a national report. It doesn’t capture the essence of a local market , or even a city market. It’s hardly helpful for home buyers entering the market, or home sellers trying to properly price a home. Furthermore, because the Home Price Index reports on a 2-month delay, its data fails to reflect the current market conditions. Versus January — the period from which HPI data is collected — mortgage rates are lower, buyer activity is up, and the federal home buyer tax credit is closer to expiring. These each can have an impact on housing. Ultimately, national real estate data like the Home Price Index is best suited for lenders and policy-makers. National data helps to identify trends that shape formal policy, but it doesn’t help you, specifically. Since peaking in April 2007, the Home Price Index is off 13.2 percent. 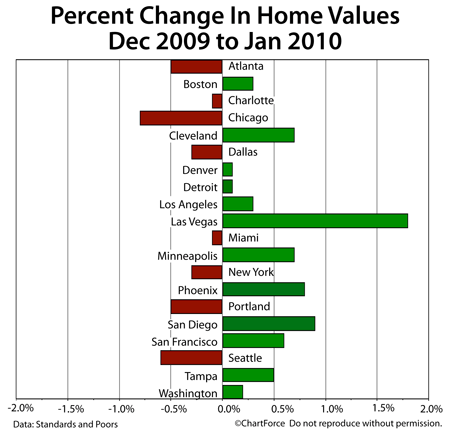 Comments Off on Home Price Index Shows National Home Values Slightly Lower, But Not Locally.